Having experienced a near-death experience myself, people sometimes ask me what dying is like. It’s certainly not the scary thing people make it out to be. 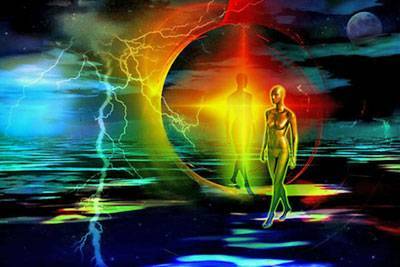 In simple terms–death is a brief loss of consciousness followed by an awakened consciousness into a whole new loving and more enlightened realm. Kind of like falling sleep and entering what we think is a dream realm, but not returning. Oftentimes, we may even receive a premonition that our transition is near. I did, even though I was sent back to do additional work. Regardless, most near-death experiencers come back reporting their understanding of death to be merely a transition into a realm that feels like one has come home from a long journey. What can we learn from the dying process? I spoke with an ex-client the other night. One who I haven’t seen in years, but who is now in the final stages of death. Massive liver damage from prescription drugs taken over the last 20 years finally took its toll on her body. She had difficulty talking with me, but drew energy from the excitement of letting me know she had made contact with angel beings already preparing her for her grand exit. She talked most about learning to love herself here on Earth despite years of chronic sexual, physical and emotional abuse by family members since childhood. She was one of those souls who had taken on extreme hardships in order to accelerate her soul growth. It didn’t kill her, but eventually made her stronger. Now nearing her end in this realm, she was free of any anger and hate, and was helping minister to others passing over during her own wait. It’s amazing how some do their best work at the end of their life, as if they know their time is limited in making a difference. My client is no different. The veil between the realms has lifted for her. “I saw my 70-year-old neighbor happily skipping down the hallway of my apartment complex last night,” she revealed, smiling. “She kept saying to me–‘I’m going home, Valerie. I’m going home!’ Then she disappeared. I was so happy for her.” The next morning my client learned her wheel-chair bound neighbor had died right around the time she saw the vision. Like an angel who has done this work from behind the veil, as well as on earth, Valerie told me of others she was helping to embrace the Light before crossing over. I was so proud of her. Doing one’s unfinished work or saying their goodbyes may appear easiest for those departing, but it’s always hardest for those left behind who have to deal with the loss. Sometimes we have to prepare our family and friends. Say what is important now, before it’ too late. Let them know you love them. I think of the late great, Joan Rivers, who filled the world with laughter. Did she know or have some premonition that a problem during routine surgery might somehow lead to her death? Deep down we all know on a soul level when our time is near–when our work is finished.